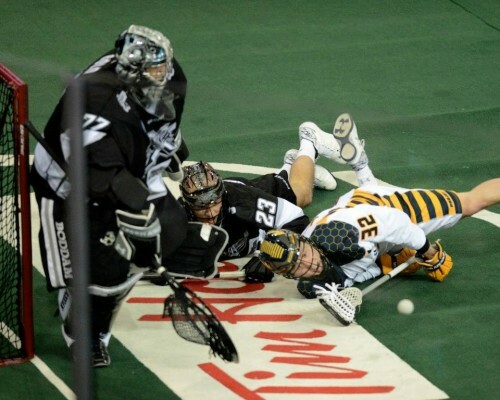 Although the Edmonton Rush have secured a home game at Crystal Glass Field for the West Division Final they still have some unfinished business to take care of. The Rush still have a mathematical chance to clinch first overall in the NLL and have home field advantage for the Champions Cup if they happen to advance to the final. For them to do so, they must win their remaining two games while Rochester clinches the East Division by winning their final two games and Toronto loses its final game to finish second. Even more important than home field advantage, these two remaining games will give the Rush a chance to work out some kinks in their game and perhaps rest Aaron Bold before the playoffs begin. Tyler Carlson will take his place if coach Derek Keenan decides to let Bold recuperate from the wear and tear of a long NLL season. Carlson has only seen a bit over 13 minutes of action this season with a .700 SVA%. The Minnesota Swarm on the other hand have been eliminated from the playoffs after having a fairly decent start to their season. They have activated Defenceman Kiel Matisz from the injury reserve list. Matisz suffered an upper body injury earlier in the season that saw him miss seven games. To make room for Matisz, the Swarm released forward Dean Hill. The Swarm will be giving some of their rookies a chance to show their talents as they have a few players out with injury. Notably forward Callum Crawford and transition Jordan MacIntosh. The Swarm coaching staff hope the fresh rookies will provide some spark and energy to he line up. The Rush have announced that they have re-signed Edmonton born defender John Lintz to a two year extension. Lintz is a key player in the Rush defence with 68 recovered loose balls. Game time tonight at the Xcel Energy Center is 8pm Est.